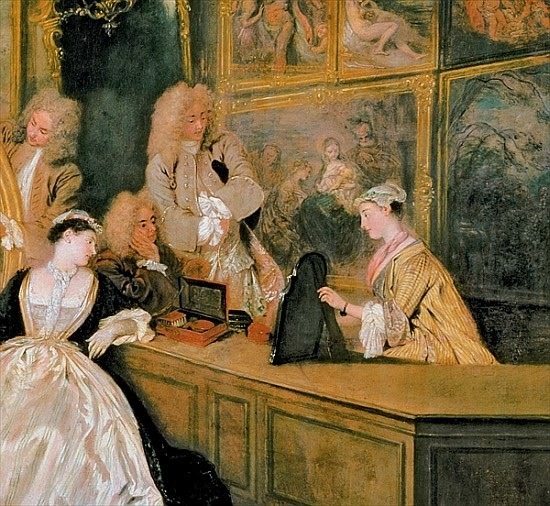 An 18th-century lady might a spent several hours a day in dressing, surrounded by servants and lackeys, or maybe even an audience of carefully chosen visitors. 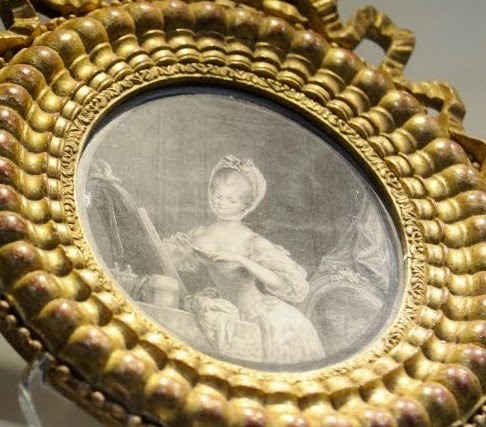 Such a pivotal activity required its splendid accoutrements in fine materials - lace, porcelain lacquer silver and tortoiseshell - the pinnacle of feminine conspicuous consumption. In the earlier part of the century, the toilet table itself was of little interest since it was the cloth which covered it, the petite toile, which was all important. As the century progressed plain linen gave way to white taffeta and embroidered muslin, whilst the most extravagant cloths of all were trimmed entirely with lace. Almost always, a short flounce would border the top of the table, with a longer flounce or flounces falling to the ground beneath. In an age when lace was handmade, such a profusion was an unequivocal statement of wealth and luxury. 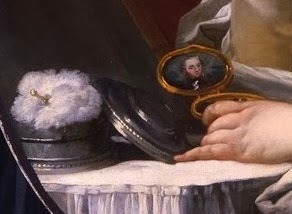 Paintings and inventories also record all sorts of additional swathing in richly coloured velvet, taffeta or satin - the rich vibrant coloured textiles hung at the back of mirrors being known simply as la toilette. The table cloth itself, however, was almost invariably white. 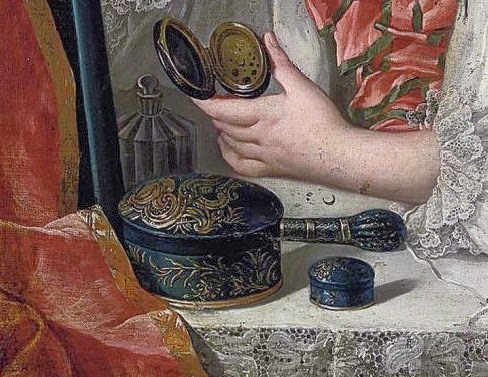 By the 1760s, cosmetics were growing in popularity so much that vanity table sets began to be heavily advertised, and dressing rooms were built facing north for the best light. 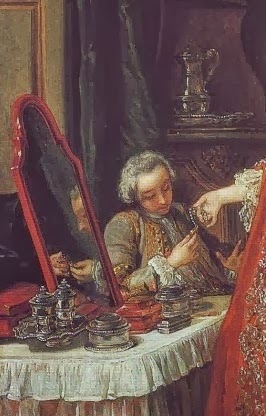 A service de toilette could comprise more than two-dozen pieces, though the mirror was always the main item; at the time of her death in 1748 Madame de Pompadour owned a vanity set consisting of “two quarrés; two powder boxes; two others for patches; another en peloton, another for roots, of rosewood; a mirror twenty inches high and eighteen wide, matching wood in its frame; two paste pots; two others for pomade; a little cup a saucer of Sèvres porcelain; a goblet and two little bottles of Bohemian glass; a bell of silvered brass" (!). 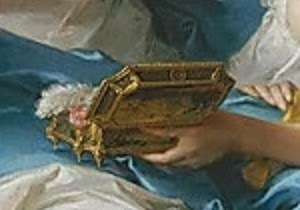 Although painted or varnished wood was the most common material, an elite owned heavy metal sets of gold, silver and vermeil. 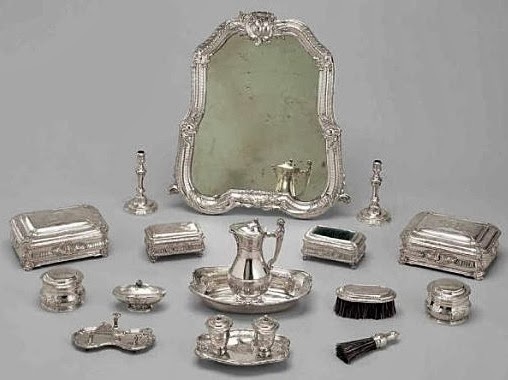 French silver sets are rare - only five examples are known to survive intact; many, like that belonging to Madame de Pompadour, were patriotically melted down to help finance the Seven Years' War. Lacquer and porcelain came into vogue in the 1750s - the Wallace collection has a fine green Sèvres service which may have belonged to la Pompadour herself. 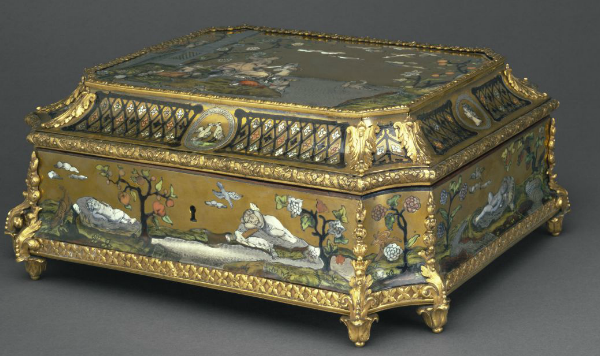 Lacquered wood in a Japanese style was popularised by Guillaume and Etienne-Simon Martin ("vernis Martin"). 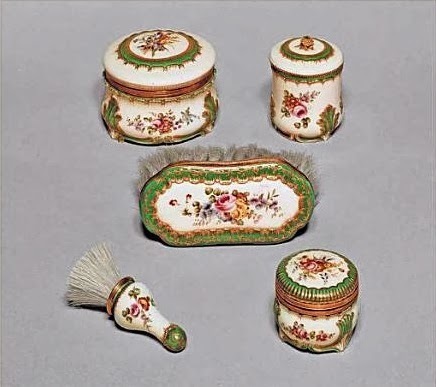 Sèvres toilet set, Wallace Collection. 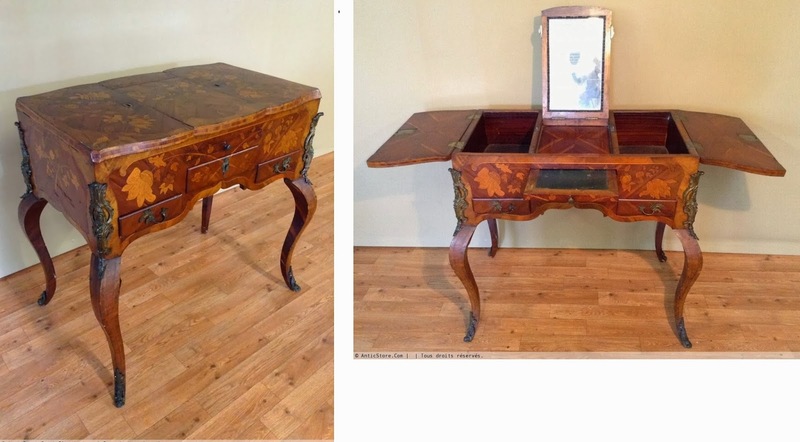 dates from the 1730s and includes a mirror weighing over twenty-four pounds. 1. Boxes for hair powder. Hair powder was bought scented and possibly coloured by the perfumer; small quantities could then be mixed with inexpensive, unscented starch. Toilette sets usually included a pair of powder containers, suggesting the possibility of varying or mixing scents and shades. White went out of fashion by the 1770s but coloured powders continued to be worn. Boxes had airtight seals to keep the powder dry and free from mites. They had to be big enough to contain large quantities of powder required. 2. Hair powder puffs. Hair powder was applied using a large powder puff (houppe); Puffs of swansdown began to appear in perfumers' inventories from the beginning of the century; by the second half of the century cheaper versions were also available, made of wool, yarn and cats hair. 3. Small rectangular whisk (vergette) to dust excessive powder from clothing. 4. Powder bellows (soufflet en poudre) replaced the puff in the second half of the century. These were more economical but less precise, necessitating the use of masks and cones to protect the face. 7. Assorted boxes for soap, sponges, combs, pins, jewellery. 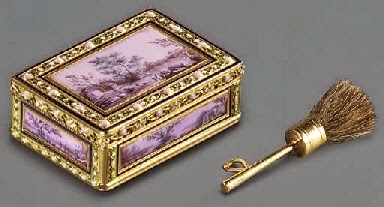 These were often called quarrés or carrés de toilette, since they were characteristically square or rectangular. 8. Root boxes (boîtes à racines) for aromatic roots and herbs used to freshen breath and clean the teeth. This is mostly taken from: Kimberly Chrisman-Campbell, "Dressing to impress: the morning toilette and the fabrication of femininity"
18th-century toilet articles from the collection of Lyons perfumer Léon Givaudan. Shown to coincide with an exhibition on "Lyon au 18e" at the Musée Gadagne in 2013.